Over 50 years of Innovation. View Infographic. Upon referral to UH Transplant Institute, patients undergo an evaluation to determine if they are eligible to be placed on the waiting list for an organ transplant. Once approved by the multidisciplinary team, the patient will be added to the transplant waiting list and available to receive organ offers. When an organ becomes available, the transplant team contacts the patient. The patient then comes to University Hospitals Cleveland Medical Center in Cleveland, Ohio, for the transplant surgery. After successful organ transplant, our expert team stays involved in the patient’s care. The patient is prescribed life-long medications to prevent organ rejection. 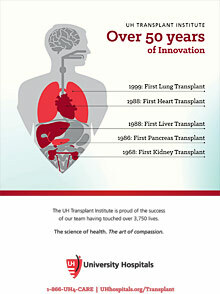 The transplant team is involved throughout the patient’s entire life. A comprehensive outpatient treatment plan is provided to the patient and the family to help the patient stay healthy after the transplant.